Liverpool take on Chelsea in a crucial game this weekend, as they furiously battle Manchester City for the Premier League title​. We've been here before, haven't we? Yes, Liverpool have not been in such a fine league position since 2013/14 when Brendan Rodgers' entertainers came oh so close to getting their mitts on the big one. There is little comparison here really. Simon Mignolet - who played all 38 Premier League games back in 2013/14 - is still at Anfield, but made his most recent league outing last season. The Belgian had a reasonable debut season at ​Liverpool five years ago, but defending was not the strong suit of Rodgers' forward-thinking side. As a result, Mignolet conceded 50 league goals in 2013/14 and kept nine clean sheets. Alisson Becker, while around seven-and-a-half times pricier, has been a big beardy wall for much of this season, conceding just 20 in 33 games, boasting a league high 17 clean sheets. His presence alone has been a boost after years of goalkeeping uncertainty. ​Again, 2019 Liverpool's favourable defensive statistics mean they are going to dominate much of the backline here, but Trent Alexander-Arnold's added threat in attack mean he's an obvious pick over Glen Johnson, whose Liverpool career was a bit of a big nothing. Alexander-Arnold is also a strong shout for PFA Young Player of the Year, with his deadly delivery providing seven league assists in 2018/19. Liverpool used several players at left back throughout their title chase in 2014, including Jose Enrique and Aly Cissokho (shudder). However, young Jon Flanagan (who also featured on the right) got the most appearances. Five years ago, it looked like the homegrown talent might turn out to be a real superstar - a lesson of how it can all fall apart for the current side's local boy wonder Alexander-Arnold. Andy Roberston's nine assists and lung-busting runs means it's three in a row for the class of 2019. Yep, of course it's Virgil van Dijk. Next. Kolo Toure, Daniel Agger, Mamadou Sakho and Martin Skrtel were the four central defensive options under Rodgers back in 2014. While that doesn't sound great (and 50 league goals conceded backs up that argument) Skrtel actually had a terrific campaign. The scary-looking Slovakian, who played 36 times, scored seven Premier League goals, including a memorable brace of headers against Arsenal in the 5-1 drubbing at Anfield. Joe Gomez and Dejan Lovren's injury problems have limited their influence this season. While Joel Matip has been a solid performer, Skrtel gets a first name on the board for Brendan's boys. ​It's Jordan Henderson vs. Jordan Henderson! The only player left from five years ago who is still a regular starter is the current Reds skipper. However, while blessed with the captain's armband these days, Henderson probably had a better season back in 2014. Playing 35 times and with more license to roam, Hendo picked up four goals, compared to one from only 16 starts this term. He is still a hugely influential player for Liverpool, but it's hard to argue he's as important on the pitch as he was in seasons gone by. Pre-slip, Steven Gerrard actually enjoyed one the finest seasons (at least of his later years) at Liverpool. The legendary captain scored 13 times (ok, a lot of them were from the penalty spot) and took up residence as a sort of quarterback, dictating play from in front of the back four. Gerrard also reached double figures for assists and made the PFA's Player of the Year shortlist. James Milner and Fabinho have been largely superb in Jurgen Klopp's system this season, but yeah...they aren't Gerrard. One of the quietest revelations of Liverpool's season in 2018/19 has been the rise of Gini Wijnaldum. 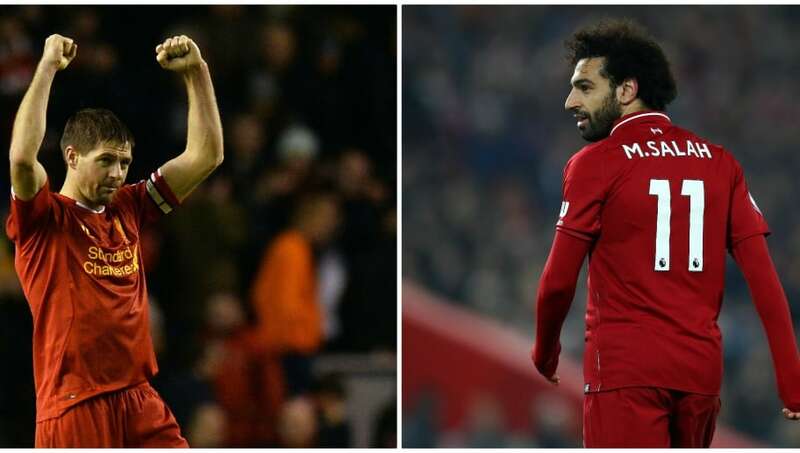 ​The Dutch midfielder, who started his Liverpool career as an attacker but has morphed into a much deeper lying player, looked like he might be surplus to requirements at the start of the season, but has started more games than any other midfielder in Klopp's side. His ability to intercept attacks, wriggle his way out of tight spaces and find passes has been essential to the Reds' game plan this year. Other players have taken the headlines but Gini has been a star. It's not a like-for-like comparison this one, as Rodgers and Klopp's formations differed quite a bit, but the Dutchman edges out a young Philippe Coutinho. Much like Coutinho, 2013/14 was Raheem Sterling's real arrival as a top level player. Still a teenager he netted nine league goals in 33 outings as part of the forward trident with Luis Suarez and Daniel Sturridge. His well taken effort after wrong-footing Joe Hart (harder to do back then, I promise) in the 3-2 win over his eventual employers Man City was a real highlight. However, even on a 'bad' season Mohamed Salah still has 18 goals and seven assists and is one of the very best forwards whose name isn't Lionel Messi. At his best he is unplayable, as his crucial counter-attack goal against Southampton last weekend showed. 2013/14 was as good as it got for Daniel Sturridge. The English forward bagged over 20 Premier League goals for the only time in his career and looked electric (and injury free!) alongside Luis Suarez. Sadio Mane, too, is enjoying his best ever season with a career high to date of 17 league strikes. After being outshone a little by Salah last season, the Senegalese has made a case as Liverpool's most important attacking player with his pace, trickery and drive from the left, or through the middle. He is a much more complete player than Sturridge ever was. Roberto Firmino remains integral to Klopp's wonderful front three...but, it's got to be Luis Suarez, hasn't it? It's not all about goals but the man scored 31 goals in 33 games and basically dragged Rodgers' fun but flawed bunch kicking and screaming to the top of the table for large portions of the 2013/14 campaign. He was also the PFA Player of the Year, FWA Footballer of the Year and Golden Boot.